Shopping for Basset Hound Gifts? If you're looking for very special Basset Hound items, then you've come to the right place. We have many items that celebrate Basset Hounds and are exclusive to Shepherds Grove, so you'll be buying something that is truly unique. There is something wonderful about seeing your dog's image depicted on a beautiful object. With our Basset Hound items, you can keep your dog close, even when you have to be away from them. Like when your office doesn't have a "bring your Basset Hound to work" policy. And really, all office's should consider this policy, for who's spirits and productivity wouldn't be lifted by having a Basset Hound on site? Also, I have heard from several customers who claim that their coffee tasted even better when drank from one of our Basset Hound mugs. Ok, that last bit might've been made up, but when you love the mug you're drinking out of, it can't help but make the drinking experience that much more enjoyable. We offer a couple of different Basset Hound coat versions and can always customize your Basset Hound items to reflect your dog's coat (for a small art fee), to make them even more personal. All of our Basset Hound gifts are made in America – right here in our Northern California studio (40.8019° N latitude, 124.1636° W longitude - for all of you cartography enthusiasts) . We start with clay, and end up with the vibrant Basset Hound items you see here. 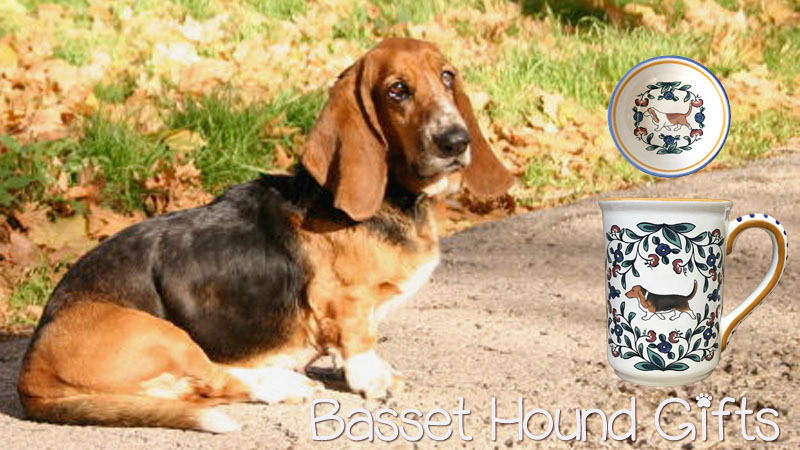 If you value beauty, combined with ease of use, then you'll love our Basset Hound pottery. Because, in addition to making you smile when you look at it, you can also toss it in the dishwasher, microwave, and oven without worry. Well, "toss" might be an exaggeration - it's pottery after all and not a frisbee. But normal day to day use is encouraged! So have a look around. You're sure to find the perfect Basset Hound Gift for the Basset Hound lover in your life!